The NFL Draft is just around the corner. Luckily for the New York Giants, this year’s draft class is filled with defensive talent. The Giants’ defense was one of the worst in the league in 2018, so expect to see them draft multiple players on the defensive side of the ball. One defensive area of weakness for the Giants is the linebacker position. Alec Ogletree was not who the Giants hoped he would be when trading for him. According to Pro Football Focus, Ogletree finished the 2018 season with a 50.7 overall grade, ranked 81st out of all linebackers in the league. The Giants will need to find more talent at that position if they want to turn it around in 2019 and beyond. This could be done in free agency, but in an effort to get younger and more prepared for the long-term future, it is likely the Giants will rely heavily on the draft. 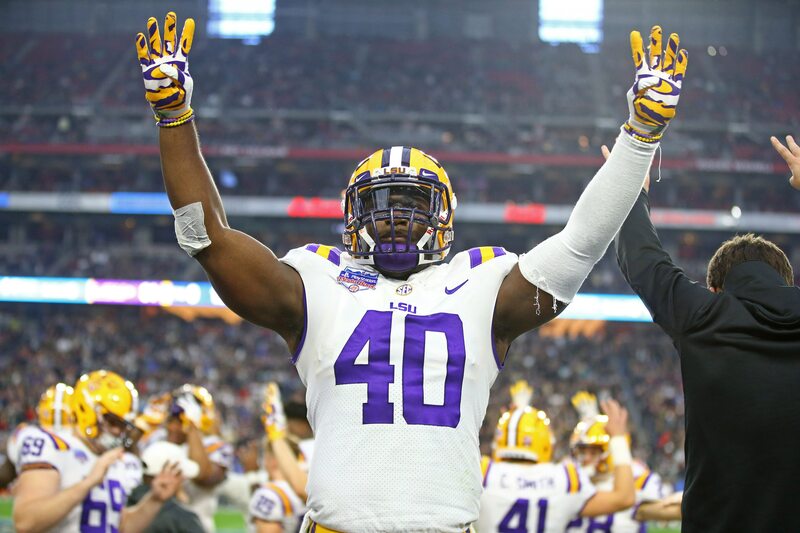 In 2019, the top linebacker in the draft class is Devin White out of LSU. Devin White is an impact player, and could very well be a top 10 pick. It would come as no surprise if the Giants have him towards the top of their draft board in 2019. White totaled 123 tackles with 12 for a loss, six passes broken up, three sacks, and three forced fumbles in 2018. He is an excellent run defender and can even provide decent coverage. White is a plug and play player, meaning he can fit in just about any defensive system. 3-4 or 4-3, White will be a force over the middle of the field. Possibly White’s most advanced trait is his ability to rush the passer from the linebacker position. On 86 pass-rush attempts in 2018, White totaled 30 pressure. That results in a 27.3 pass-rush efficiency, which is top of the class. The junior will be at the Combine in March, so Giants fans should keep an eye on him. He is an athletic freak, so expect him to light it up in the workouts. Another Devin that should be on the Giants’ big board is Devin Bush. Unlike White, Devin Bush is not a lock for the first round. He could potentially be a second or third round pick. If the Giants plan on drafting a quarterback in the first round, the second or third round could be a perfect place to draft a linebacker. Devin Bush out of Michigan was very productive in his time at Michigan. In 12 games as a junior, Bush totaled 66 tackles with 8.5 tackles for loss. He has also been very effective on the blitz, according to Pro Football Focus. Bush has 33 pressures (nine sacks, three QB hits, 16 hurries) on 122 rushes over the last two seasons. One knock with Bush is his is lack of size. He is expected to measure at about 5’11” and weigh in at 232 pounds at the combine. His size might scare some teams away, leading him to slip into the second or third round. This could make him a day two steal in the 2019 NFL Draft. Out of USC, Cameron Smith is a mid-round prospect that the Giants should consider. He could be a steal in this draft if he progresses at the next level. He is projected to be a round 3-5 draft pick. Smith checks in at 6-foot-2, 253 pounds with 33.25-inches, 10-inch hands and a wingspan of 77.38 inches. He is said to run the 40 in 4.65 seconds. In 2017, Smith’s junior year, he played all 14 games and totaled 112 tackles with 11 tackles for loss. He was not disruptive in pass coverage, as Walter Football reports, he is a bit stiff and slow to cover in the NFL. But he did wrack up 4 passes defended in 2017. As a senior in 2018, Cameron only played 9 games but flashed his run defense skills that were on full display in 2017. He came away with 81 tackles in 9 games with 7.5 tackles for loss. In 2018, the Giants’ run defense ranked 20th in the NFL against the run, allowing 118.6 rushing yards per game. The Giants could use an impact linebacker against the run, and Cameron Smith could be that guy. If he can gain some quickness and progress his coverage skills in the pros, Smith could be an excellent linebacker.